This year the Cool Family opted for some extremely cheap, simple, and easy no-sew Halloween costumes. Thankfully Adaline insisted on being a Black Cat this year. I was going to go the leotard route but figured it was pointless to spend the extra money, especially if she would end up being too cold. She wore a black long sleeved shirt and black pants that she already had. We got a cat kit for $5 at Target which included the ears, tail, and bowtie (it also came with a weird nose, but it looked awkward). A little eyeliner nose and whiskers and we’re done! When I was 2 years old I was also a scarecrow for Halloween. That’s me on the left. Do you think Jon and I look alike at all? I decided to go as a nerd because I only needed a few accessories to complete the costume: nerd glasses, suspenders, and a bowtie. I will tell you that I’m not happy with my accessories at all. We went to Party City because it was closer and these were the only options. I think the glasses are too “trendy”, the bowtie is too “cocktail waitress”, and it was all pricier than I would’ve liked. After I’d already bought the stuff I found cheaper and more appropriate accessories at a Halloween store at the mall. So I’m disappointed. Because I wasn’t entirely thrilled with my nerd costume (I hated the bowtie in particular), I decided to change it up and go specifically as a Harry Potter Nerd or a Potterhead, if you will. I already had the awesome Gryffindor t-shirt and scarf, and the round Harry Potter glasses. Yes, I already had those, just for every day use. Because, shut up. It ended up being chilly so I wore a gold cardigan that I already had that matched perfectly and in the end I decided to wear the nerd glasses instead of the Harry Pottery glasses. Fascinating stuff, right? 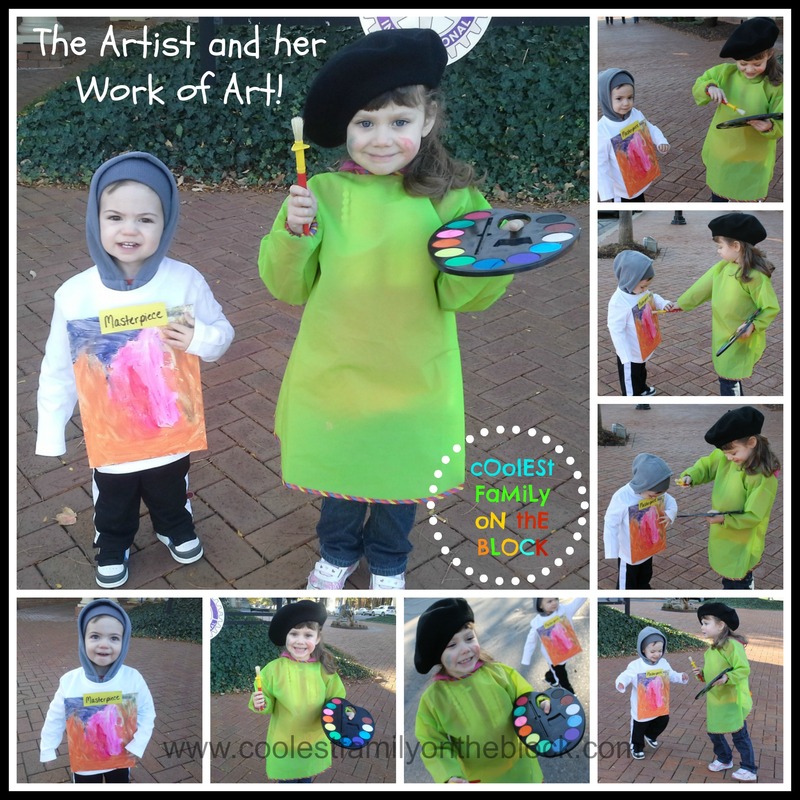 Last year Adaline and Jon went as an Artist and Masterpiece. What did your kids dress as for Halloween this year? What’s your favorite go-to last minute costume? I am lazy. I don’t sew and I refuse to spend $30 on a child’s costume that is ugly and will fall apart. My 4 year old daughter kept changing her mind about her costume from ghost to kitty to my personal favorite, “I just want to be a regular little girl”. My daughter loves, loves, LOVES to draw and paint and so I suggested that she be an artist. She loved the idea. She loved the idea even more when I said that her little brother could be her work of art and that she could (pretend to) paint him. So simple and easy! The costume was a huge hit! 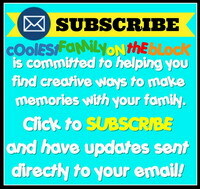 We got a lot of compliments on how cute and creative the concept was. It was mostly laziness rather than creativity, but hey, I’ll take it! 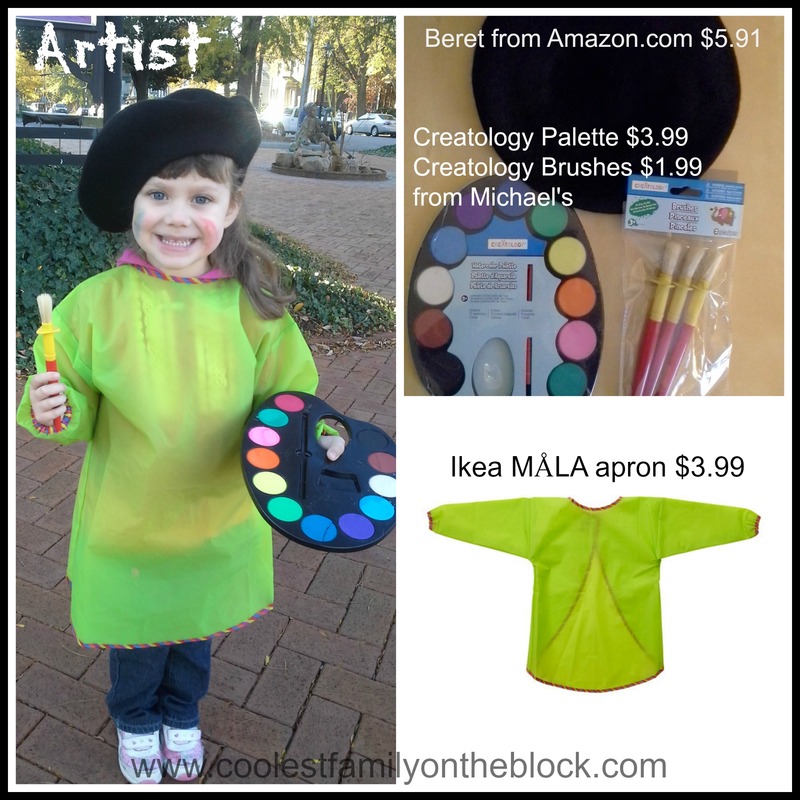 My daughter already had this art smock from Ikea. I wanted to have paint splatters all over her, but that smock wipes up so nicely that nothing will really dry on it 😦 I found the beret on Amazon and I had a Swagbucks giftcard, so it was free! I got the artist’s palette and paint brushes at Michael’s. We have paintbrushes at home but I wanted something a little bigger. There was a less expensive plain white palette but I let Adaline choose which one to get. She chose the watercolor palette which was fine because she would definitely use the watercolors and now I didn’t have to add paint to the white palette for her costume. If you don’t have an art smock you can use an old white button down shirt as a smock. Be sure to smear it with lots of paint…artists are never clean! If you don’t have a palette and don’t want to buy one you can always make one by cutting the shape into cardboard or cardstock and coloring in the paint. That was more work than I wanted to do (remember the keyword today is “lazy“), so the $4 I spent on the palette was worth it to me. I also think it would be cute to draw a curly mustache on your artist, but my daughter was having none of that! It’s important to note that I got my son’s shirt a little larger (he wears 18-24m and this shirt is a 3T) because you need the extra room once the canvas is glued to the shirt. If the shirt were any smaller I wouldn’t have been able to fit it over his head. The canvas panels I used were a set of 5 from Michael’s. You can get single canvases as well, but they didn’t have any at Michael’s and I knew that my daughter would use all of them. 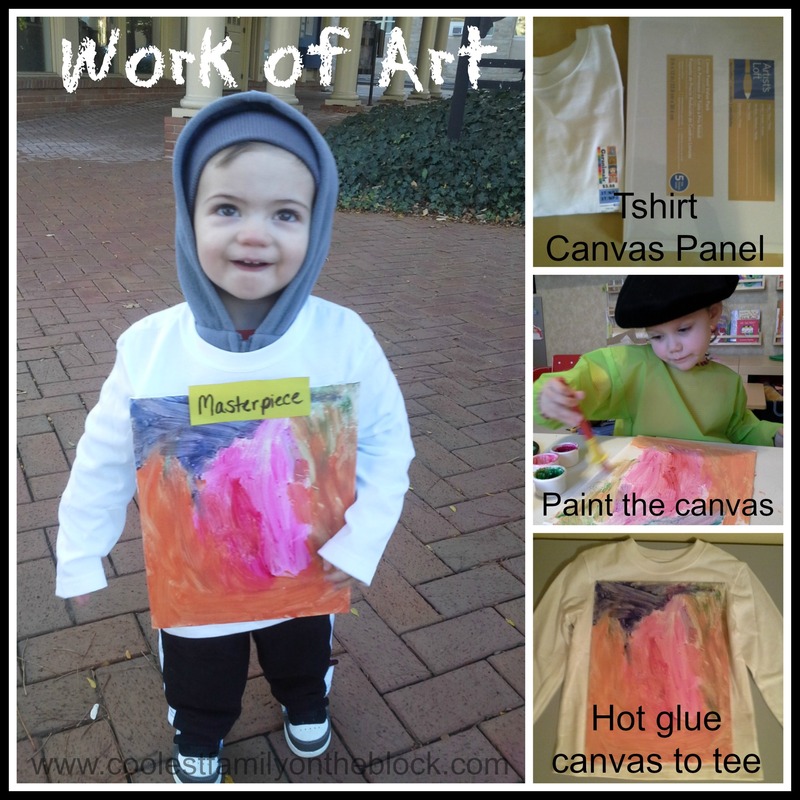 Instead of using a canvas you could use card stock, card board, poster board, a pillowcase, just about anything that you can paint/draw on and then attach to or hang from a shirt. You can even just draw/paint directly onto the shirt itself. It doesn’t get any easier than that! 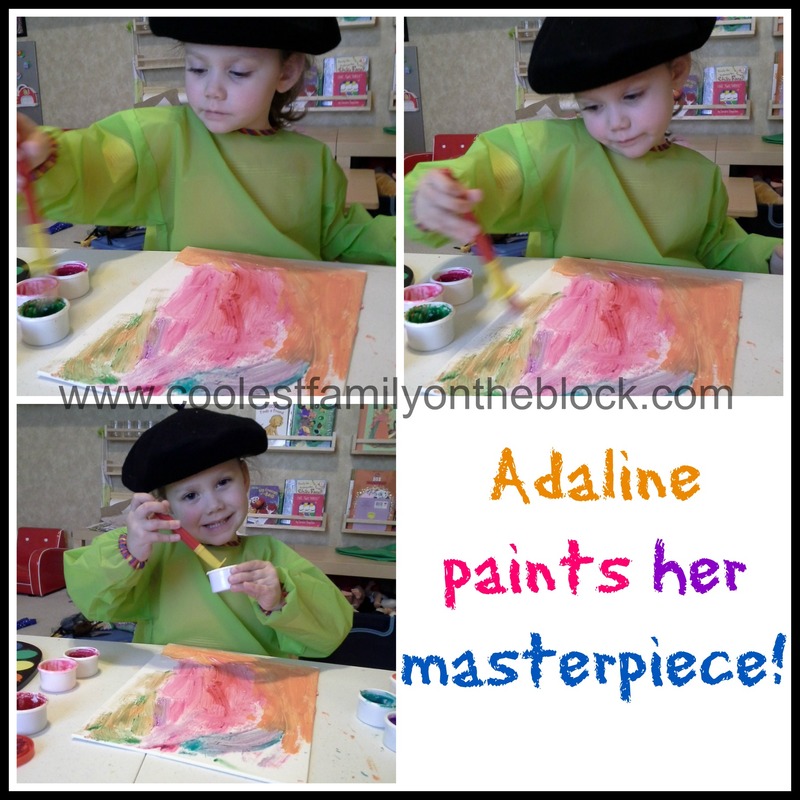 Adaline actually painted the canvas herself. After it dried I hot glued the canvas onto a long sleeved tee. Did your kids dress up for Halloween this year? What is your favorite “lazy” Halloween costume? *If you’d like a laugh (or nightmares) read about 1984 Creepy Costumes on my other blog. 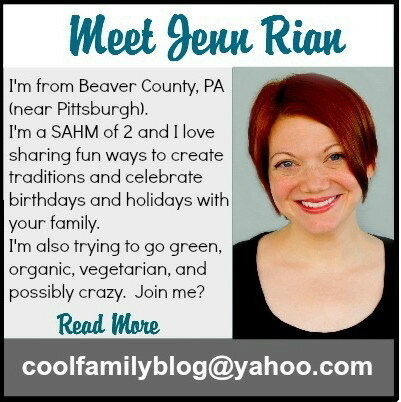 Read my personal blog www.imakemyselfthequeen.com.